The Sons Of Liberty - Bradlee Dean: Freedom to Break the Law? 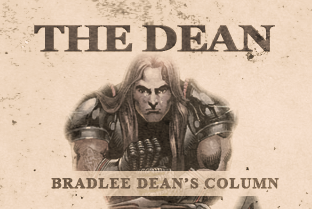 Home - The Dean-Bradlee Dean: Freedom to Break the Law? “The known propensity of a democracy is to licentiousness, which the … ignorant believe to be liberty." In light of the George Zimmerman trial, many people are watching the media circus fabricate its next deception. While the media are attempting to divide America through racial wars that belong not to this generation, they have been exposed time and time again for their outright lies concerning this case. If it is not MSNBC omitting portions of Zimmerman’s 911 call, or jurors proclaiming that the media showing only pictures of an innocent little black boy has deceived them, then it’s prosecutors who are withholding evidence that would exonerate Zimmerman. Now, I know that in America today most believe that the grace the American church has been teaching, “a license to go and use that grace as an occasion for the flesh” (Galatians 5:13), is the right to break God’s moral law, but in fact, that mindset stands in direct contradiction to its true definition. Have you noticed in today’s society that equality is talked much of, of course without reference to the law or right-giver?